Now is the time to take advantage of our hot tub maintenance and service contracts. As a special introductory offer, book any service in February and we will offer you a years contract for 11 months payments, so one month is on us. Buying a hot tub can be a large investment, sometimes as much as people pay for a car. Ask yourself if you would run your car year after year without having a service? Especially if you have paid in excess of a thousand pounds for it. You just wouldn’t do it and expect the car to continue to be trouble free and at its best economically. In the same way your hot tub needs to be serviced at the very least annually. 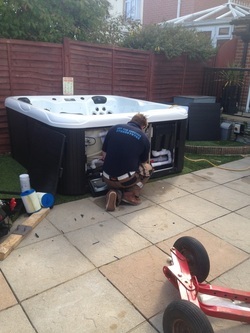 A good hot tub service ensures you keep your hot tub in good condition and hopefully trouble free. If you are using your hot tub regularly it may also be an idea to change the water every three to four months too. Hot tubs used at holiday cottages etc need to have the tub water changed and cleaned a lot more regular depending on bookings etc. A professional good quality spa service usually takes between 2-4 hours maybe more, depending on the condition of the tub, water pressure and any additional work that may be needed. The service normally involves a good all over check, pipe flush, emptying, deep clean, refill and check again. 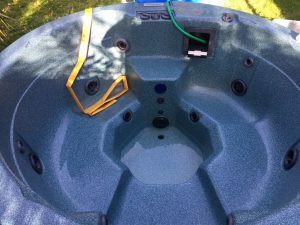 This is a brief overview the full details of what is carried out at a minimum can be viewed on our hot tub service page. Most good quality services usually cost around two and a half hundred pounds, this takes into consideration travel, time on site (usually half a day), chemicals and consumables used to clean the tub. This one of cost ensures your hot tub is in good condition for the coming year. So why not spread the cost over the year with a Healthy Hot Tubs service contract option and receive the additional benefits as detailed below. While some people will question why they cannot do this themselves, (which they quite possibly can do if they have a good electrical and mechanical background.) the time taken along with the costs involved it will soon become apparent the value of a hot tub professional carrying this out. Consider that during a full service carried out by a healthy hot tub professional engineer, he advises that a massage pump needs a new capacitor. This little find could save the pump and in turn cost approximately £25 instead of around £200- £400+. Add to this the fact that nearly all services result in the amount of electricity pull reducing on the hot tub and you are already seeing huge benefits. (We check this). So the benefits of a good service are apparent just as alluded to before with the car service example. 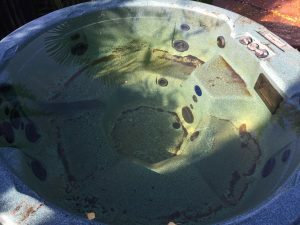 Additionally as well as a good hot tub service, healthy hot tubs can also incorporate a repair package into your contract. This gives you a service and repair contract or service and maintenance contract, whichever suits. We can take all the hassle and a real chunk if not all of the surprising one off costs away. We can cover your labour and call out charges as well as a massive reduction on parts all in the same or separate package. Take into consideration this example: One of your massage pumps unfortunately fails, a typical industry cost would be £100 + VAT for call out and diagnosis including the first half hours’ labour. Additionally, lets say for example the pump is £250 + VAT and the tub requires draining to change the pump and refilling to test. Industry standard pricing could denote that’s an additional £50 + VAT labour for the extra time. So the total bill could be £400+ VAT = £480. If you assume you are a healthy hot tubs service and maintenance contract holder you will benefit from inclusive labour and call out charges saving £180 from this example. In addition another 10% is discounted on parts. So the total bill now is £270 a £210 saving. Depending on your personal service package you may have only paid £120 in monthly payments for the year to receive that saving of £150. Most importantly though is the peace of mind and hassle free enjoyment that can be enjoyed knowing that Healthy Hot Tub professional hot tub engineers have you covered. Benefits of having a good service and maintenance contract is that the cost can be spread over the course of a year and at a cheaper price along with additional savings. Additionally subject to available access and permission, our engineers are self sufficient and only require an outdoor electricity and water supply, allowing the customer to carry on with their day to day activities unaffected by the engineer visit. Additionally you will become a member of the healthy hot tub hot tub maintenance and service contracts family, receiving our newsletters full of handy tips and special offers, along with anytime support for questions. So in conclusion just as in the example of running a car without servicing it, the same applies to your hot tub, you would be crazy not to. And for peace of mind and discounts why would you not take out a monthly contract? For Hot Tub Maintenance and Service Contracts Contact us on 03337720082 or alternatively email us at info@healthyhottubs.co.uk for more information. We can tailor any of our contracts to your needs.